Hats for Headway Day – Design your own hat, or wear one you just love in return for a small donation. Brain injury has many causes but the most common are head injury, stroke, brain tumour, and illnesses like meningitis.​ Brain injury can happen to anyone of any age. Brain injury not only affects the individual, but the whole family. Headway is a national charity that provides support and advice to people with brain injuries ​and their families and carers and training and information for professionals​. Headway Devon is the local branch, based in Exeter with additional centres in Exmouth, Honiton, Tiverton and Torquay. Headway Devon’s mission is to ensure that when a person’s life is turned upside down by brain injury, they and their family get the help and support they need and deserve. Every year people across the country help to raise awareness of brain injury by wearing their hat for Headway. Hats for Headway Day is a simple, fun, and easy way to raise money for Headway Devon. Just like a dress down day, all we ask you to do is wear a hat (the wackier the better!) for the day in return for a small donation. 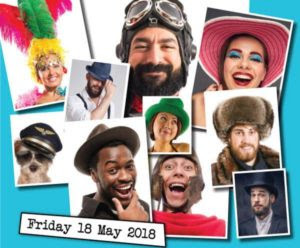 This year the official Hats for Headway Day will be Friday 18th May – the Friday of Action for Brain Injury Week – but if you would prefer to hold your event on a different day, that’s no problem. By Rachael Vickers| 2018-05-11T14:48:18+00:00	May 11th, 2018|Comments Off on Hats for Headway Day – Design your own hat, or wear one you just love in return for a small donation.